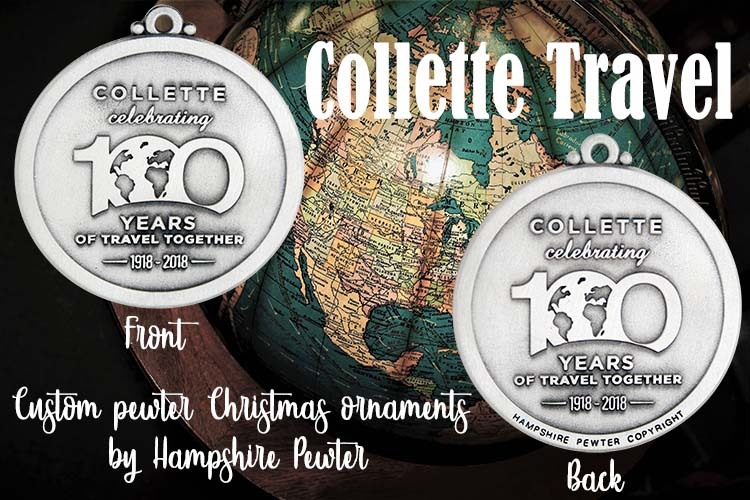 The Collette travel company reached out to Hampshire Pewter to help them create a one-of-a-kind piece for their 100th year of travel! We always enjoy the collaboration involved in making a new custom piece come to life! In over forty years of business we have created hundreds of custom ornaments, coins, and keychains for cities and towns, colleges and schools, and corporate organizations. Each new custom project that we work on gets the expertise and experience that comes from our many years in the fine pewter business. We don't take lightly the task of making something long-lasting, unique to our clients, and finely crafted. Known worldwide for their many unique and unforgettable tours, the Collette brand is one that speaks of excellence and quality. The custom Christmas ornament that we were able to create for their company's 100th anniversary is a quality piece that will look simply elegant hanging on the tree at Christmastime. It is double-sided and features the text "Collette celebrating 100 years of travel together 1918-2018." Included is their 100th anniversary logo which has the globe as one of the zeroes in 100. Because we hand-cast all of our pewter, we are able to capture depth and dimension in designs like Collette's that you simply can't get from other craftsmen. For more information on our custom pewter process, please click here. We would love to have the opportunity to work with you as you design a piece that your friends and community will be sure to treasure for generations to come!